Slow-Cooker Pot Roast with Gravy is an easy way to make a hearty meal that everyone will love. 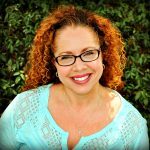 Gluten-free, Paleo, Auto-Immune Protocol Diet and Whole30. I’m a busy mama of four and I cook three meals a day for my family. On Saturdays, I try and make sure that I utilize my slow-cooker for Saturday night dinners. Saturday is my day of rest, and that way I can enjoy my day and not have to worry about cooking dinner. 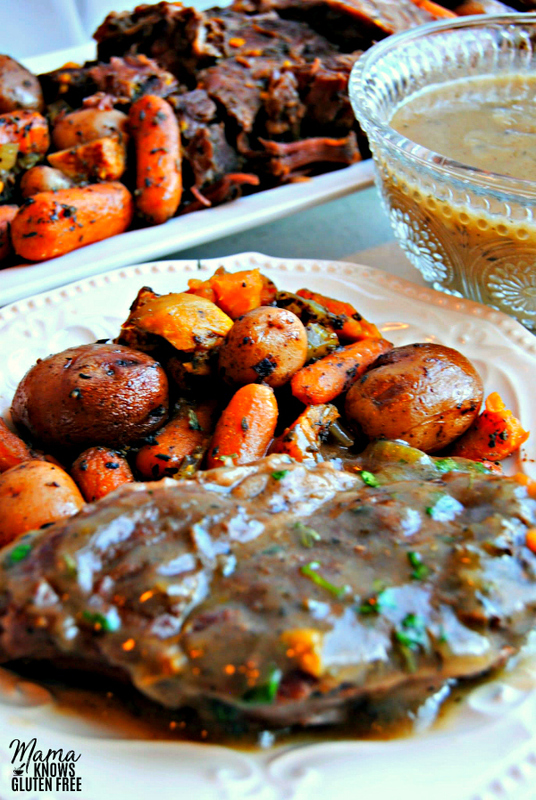 One of my family’s favorite slow-cooker meals that I make is Savory Pot Roast with gravy. The key to a great and tender pot roast is not only the cut of meat you buy but the pot roast seasoning you add to the slow-cooker. The right amount of seasoning and liquid makes for a tender and savory roast and vegetables. 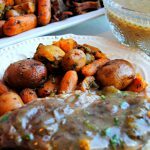 My savory pot roast seasoning blend along with gluten-free beef broth made cooked along with the roast and vegetables makes the perfect broth to make savory gravy. Gluten-free gravy is not complicated to make, and the addition of gravy takes the pot roast to the next level. 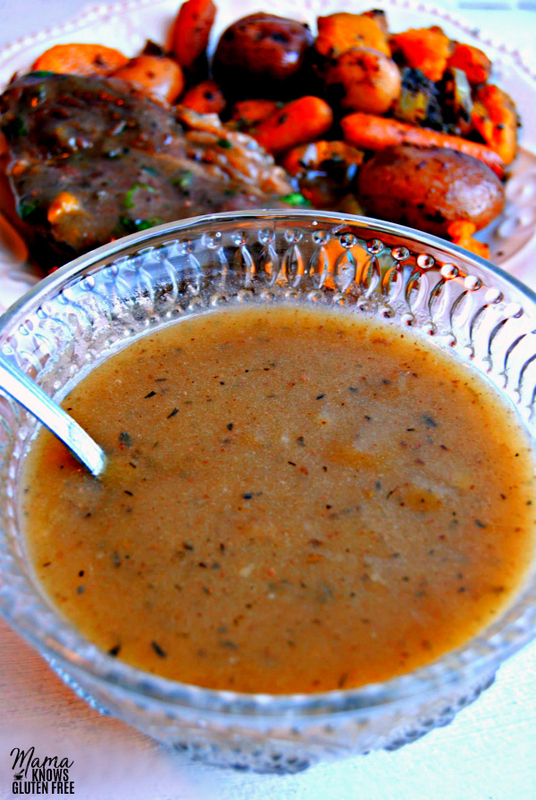 It does not get any easier than my gluten-free slow-cooker savory pot roast with gravy. Make sure that you put your roast on at lunchtime so that it will be done by dinnertime. Using a slow-cooker is an easy way to cook a hearty meal that everyone will love. I promise that you will love how tender and flavorful your roast will turn out. Looking for more tasty and healthy meals that are AIP, Paleo or Whole30? Check out these gluten-free dinner recipes. Slow-Cooker Savory Pot Roast with Gravy is an easy way to make a hearty meal that everyone will love. *Depending on what stage you are in with the reintroduction of the AIP diet you may not be able to eat the gravy. Add 1 tablespoon of olive oil into the slow-cooker. Salt beef roast and add to slow-cooker. 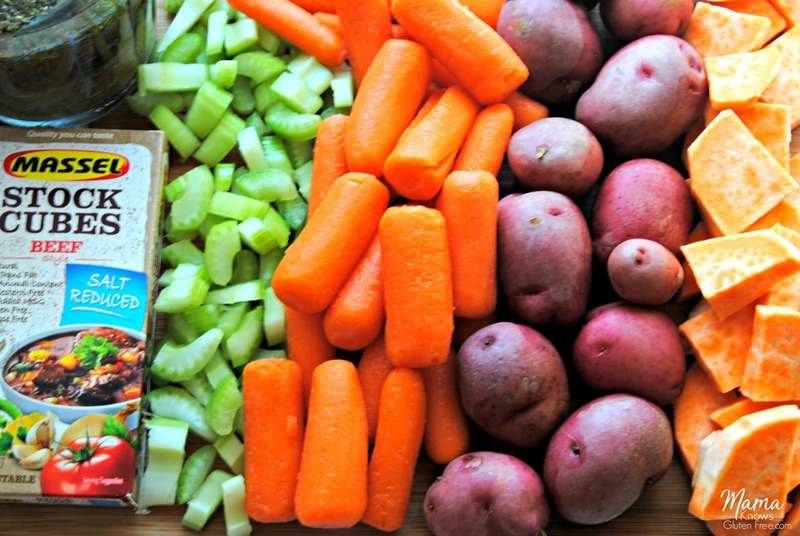 Add chopped carrots, chopped celery and peeled and chopped sweet potatoes/white potatoes to slow-cooker. In a large glass measuring cup add all of the seasonings and apple cider vinegar to the beef broth and stir to combine. Pour beef broth mixture over the vegetables and meat. Cook on high for 4 to 5 hours until vegetables and meat are tender. Carefully pour the liquid from the slow-cooker into a small pan. Add the cornstarch and gluten-free flour to the liquid and whisk over a medium heat until fully combined. Bring to a slight boil, stirring until thickened.